J Brand Fits Like a Glove! J Brand continues to amaze with innovative, gorgeous new looks. 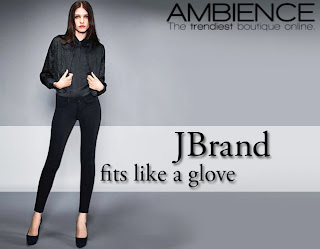 These fashion super skinny jeans in a black scuba fabrication are so flattering on and they fit you like a glove. The front pockets are faux so they keep the line clean with patch pockets in the back. Button closure with zip fly. Other than the fit the best part of these jeans is that you can wear them anywhere and they travel wrinkle free!